Discussion in 'XJ Modifications' started by Praxeus, Feb 3, 2019.
i did the fender/wheel rim a long time ago, i do those acewell's or bicycle ones on all my bikes. now for some extra confusion, i think a guy could add some wire and mount the pickup on the swingarm, and still use the wheel rim magnet. What is this spacer in the picture? What did you make this out of or was this a Home Depot find? 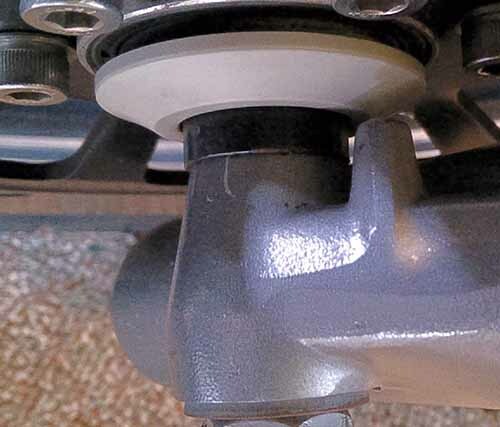 It looks like it snugs up to the hub nice and keeps all the nasty out of the bearing. I may just gut mine of all the gears inside. I think you must be talking about the metal collar holding in the white grommet/bearing cap? I don't have one of those. i don't remember if i made the metal spacer or not. but i kinda doubt it, that would be asking a lot from the lathe i had at the time. Thanks for all your replies. I think I may keep the drive dog on the axle with the circlet ring that engages the drive removed. For some reason I thought it might put drag on the wheel but it just sits on the axle so I'm just being dumb. May I'll even mount the magnetic pickup to the pre-drilled holes on it. Alright, so I have all my connections working with the Acewell gauge, (it’s a 4553 unit) including stuff that never worked before until I changed out my LH controls, but just as I was heading home (in my truck) I put the seat back on and just decided to chill and play with the mode settings. Neither MODE or RESET do anything at all! I haven’t saudered any connections yet but I’m pretty sure the grounds are okay. The gauge powers up and shows N, oil light until kill switch is turned to on, and signals. Earlier tonight I pressed mode and it cycled though everything. I disconnected the battery and reconnected, and disconnected the red power wire and hooked it back up. Nothing. The buttons depress, but the green remains frozen. The tach needle does it’s little flip back and forth when you turn the key. This was a major splurge to my project and I’m pretty &@%# ticked off. Hopefully it is something simple. Any ideas why MODE and Reset buttons aren’t doing anything? The internet has been no help thusfar and there is no troubleshooting guide in the manual.